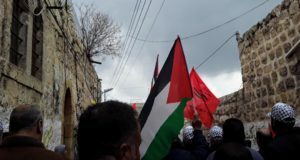 Around six hundred Palestinians along with a small number of international and Israeli activists participated in today’s demonstration in the lands between Silwad and Deir Jreer, in protest against both settler violence and settlement expansion. A new illegal outpost of Ofra settlement consisting of several caravans was established on the villages’ land 20 days ago. This sparked the several days of clashes, followed by this Friday demonstration, one of the first organised with collaboration between the villages. 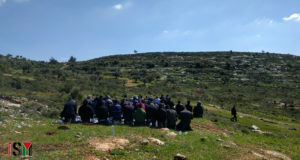 The protest began as midday prayers were held on a hilltop facing the new illegal Israeli outpost. After the prayers, demonstrators proceeded to march towards the outpost but were soon met with excessive amounts of tear gas, rubber coated steel bullets and stun grenades, shot by Israeli forces standing on a nearby hilltop. 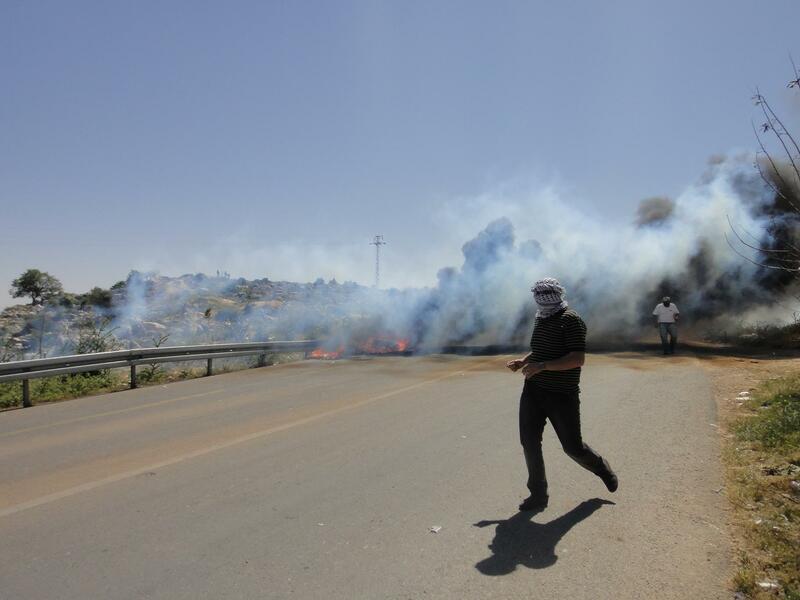 As protesters got closer to the outpost Israeli forces pursued the group, shooting tear gas canisters at them. Multiple rounds of tear gas canisters were also fired from military jeeps. Several demonstrators were treated by Palestinian Red Crescent medics for tear gas inhalation, including some children. 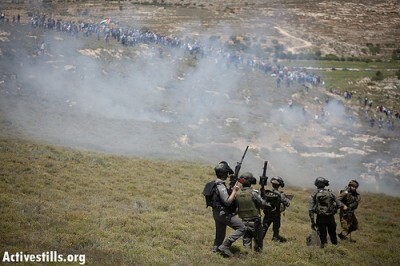 The demonstration finished at around 3pm when Palestinian activists left the fields. Despite this, Israeli forces continued shooting tear gas at the nearby road where people were standing and cars were driving past. Settlers from nearby Ofra settlement recently raided the village of Deir Jarir, setting fire to ten of the resident’s cars. 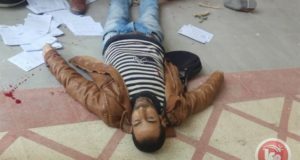 Earlier in April settlers severely attacked a Silwad villager who used to be a judge, beating him with an iron rod until he lost consciousness. Silwad has seen consistent clashes in recent weeks due to this violence and the establishment of the illegal Ofra outpost twenty days ago. This outpost consist of caravans and huts situated on Palestinian farm land that the residents of Silwad, Deir Jarir, Taibe and Ein Yabrud have been denied access to for over a decade. A settlement outpost is the first move made by settlers when conducting a land-grab in the West Bank; establishing temporary buildings which are protected by the military and eventually made permanent, in order to establish ‘facts on the ground’ and steal Palestinian land.